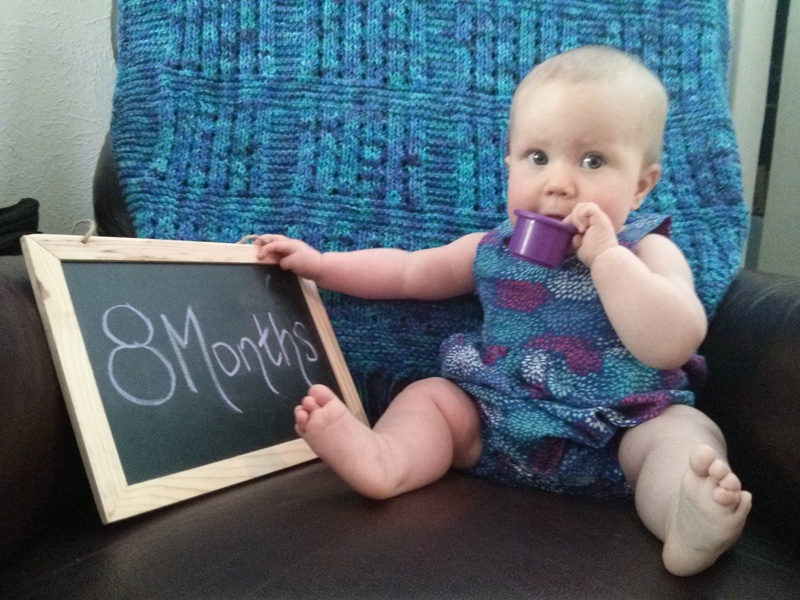 Annabelle Rose: Month 8 | Team Alzen! Foods she’ll eat to-date: butternut squash, sweet potato, zucchini, carrots, apples, pears, bananas, kale (w/ fruit), and hard-boiled egg yolks (w/ sweet potatoes). AB easily rolls both directions now. She can move herself about an open floor relatively easily and is quite inquisitive about all the new things she can access. So far, I’ve been able to use Husband’s jits mats to create a safe area for her to play in while I work at my standing desk. I’m hoping this set-up works for a while. She’s enjoying food more and more, and I’m planning to start finger foods in the near future. There’s been a notable change in her speech this month as well. She went from seemingly experimenting with what her voice sounds like to clearly attempting to make intentional sounds. This little one is also now able to stay up over three hours between naps and definitely has better naps if she stays up a little longer. Sleep at night is still hit or miss, but more hit than miss.